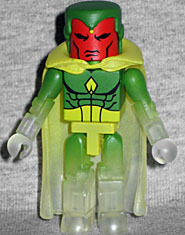 The Vision was created by Ultron to destroy the Avengers, however the synthezoid rebelled and would later join the team and marry the Scarlet Witch. Vision was born to be an Avenger: he was constructed from the body of the original Human Torch and the brainwaves of Wonder Man - no wonder he rebelled! I've never really been a fan of the red, yellow and green look for the character - the white works much better - but it's handled well here. The details of his anatomy are blocky, since he's a robot, and his cape and cowl are new pieces. Like Kitty Pryde, this figure seems to confuse "intangible" with "invisible," because his arms and legs fade to clear as you move away from his center of mass. With no powers to fall back on, the Avengers' brash archer Clint Barton relies on Olympic-level conditioning, dedication and a cache of trick arrows to defeat his enemies. 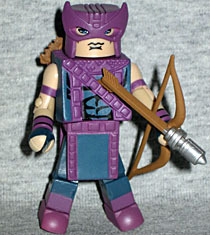 Technically this is the second Clint Barton Minimate, but it's the first that's indisputably him. He gets several new pieces to create his costume, too! We start with his unique mask, which has the eyeholes cut out so he can see. He has a full chest cap, because that was the only way to get a quiver on his back, though that does make him look too bulky (a problem that would be fixed years later), and finally a loincloth/skirt thing. His bow is new, and he includes an arrow to fit into the notch on the side - an explosive arrow, judging by the tip. 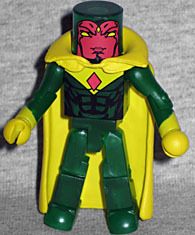 This set was the one in Series 20 to come with a variant - in this case, Vision 2.0. The combination of Iron Lad's 31st century armor and the Vision's original programming, this new Vision is a valuable member of the Young Avengers. Vision gets a variant, but it's not the white costume? Aww, man. Like the bio suggests, Vision 2.0 is the version from Young Avengers, and unlike some companies, Art Asylum actually got that right. He's cast entirely from translucent green plastic, for some reason - it makes for a visually interesting Minimate, but it's not really something from the comics. The yellow and red portions of his costume are solid paint, which makes for an odd contrast. His anatomy is more organic than Vision 1.0's, as it should be. The two share the same cape, but Variant Vision doesn't fade to clear, and neither does his cape. This set isn't very thrilling. Hawkeye and Vision are both important figures if you're building an Avengers team, but on their own, they're lackluster. The variant doesn't make a ton of sense either, since we don't have any other Young Avengers to go with him. Oddly enough I've always had an affinity for Vision BECAUSE of the red, yellow and green combination (and find the white one... no good) - we truly are mirror opposites! I got this set for the characters and 'cause the Hawkeye is awesome (especially the arrow/bow connectivity feature) but both Vision's seemed to short-change the costume/character/figure with it's translucency. However, the 2.0 looks much more solid, and therefore better than I expected - does look the same in person, or more see-through-y?